An Admiral Told a Senator Most Navy Reforms Were 'Complete.' Navy’s No. 2 Says Otherwise. WASHINGTON — Lt. Cmdr. Jennifer Pollio could not believe what she was hearing from the Navy’s top officer. It was Jan. 25, 2018, and Adm. John Richardson, chief of naval operations, was addressing an auditorium filled with Navy attorneys. One officer asked a question that touched on a sensitive topic: two collisions of warships in the Pacific in the summer of 2017 that left 17 sailors dead in the Navy’s worst maritime accidents in decades. The Navy had recently announced that it would criminally prosecute the captains of the vessels and several crew members for negligence leading to the fatal accidents. The questioner wanted to know whether officers now had to worry about being charged with a crime for making what could be regarded as a mistake. Richardson answered by saying that he could not discuss pending cases. As a bedrock principle of military law, commanders cannot signal a preferred outcome. But then, almost as an afterthought, he attempted to reassure the man that the collisions were no accidents. “I have seen the entire investigation. Trust me, if you had seen what I have seen, it was negligent,” Richardson told the audience, according to court records. Pollio, a Navy attorney, was alarmed. It appeared to her that Richardson had effectively pronounced guilt before trial. And he had done so in public, in front of an audience whose members could conceivably participate in the military’s judicial proceedings. “I was shocked that he would say that,” Pollio would later recall in court testimony. Commanders are central to military justice. In most cases, they select jurors, approve plea deals and have a say in the outcomes. The prosecutors, defense lawyers and judges are often all service members. They are charged with being independent, but some, inevitably, are conscious of their careers and the desires of higher-ups. It is a system rife with the potential for bias. That’s why commanders are forbidden from even giving the appearance of trying to sway results. Unlawful command influence has been called the “mortal enemy of military justice” because it undermines faith in the system’s fairness — not just among members of the military, but the general public, too. Yet the January meeting was neither the first time, nor the last, that Richardson would be accused of attempting to influence the results of the inquiry into the collisions of the USS Fitzgerald and USS John S. McCain. That fall, Richardson had told reporters at a press conference that the ships’ officers were “at fault” because of their negligence. On another occasion, he told reporters that “there was nothing that was outside the commanding officer and the crews’ span of control” before the collisions. In testimony before Congress, he again held the captains of the ships culpable, saying they “had complete ownership” of the causes of the collisions. Richardson made investigating the accidents involving the Fitzgerald and the McCain a primary focus of his command of the Navy. He ordered multiple, in-depth examinations of the incidents. He promulgated reforms designed to put more sailors on ships based overseas and increase training in basic navigation skills. But his pursuit of accountability for individual sailors has been deeply troubled, and the prosecutions of the men and women on the two destroyers are today in shambles. 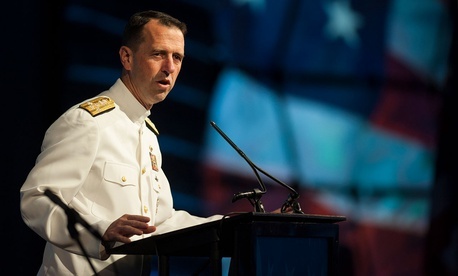 Indeed, Richardson, who holds the most senior uniformed position in the Navy, was found by a judge to have violated the protections against undue command influence, a stunning result in one of the most high-profile cases of military justice in years. A ProPublica examination of the cases based on confidential Navy documents, emails among top officials, court records and interviews shows that the criminal prosecutions of the accidents involving the Fitzgerald and the McCain were marred by questionable decisions and egregious mistakes. Late Wednesday, after ProPublica informed the Navy of its findings, the Navy told families of the fallen sailors that Richardson will announce that he is dismissing the cases against the captain of the Fitzgerald and a junior officer. Instead, both will receive letters of censure from Richard Spencer, the secretary of the Navy, a public finding of wrongdoing. A Navy spokesman confirmed the planned actions late Wednesday. “This decision is in the best interest of the Navy, the families of the Fitzgerald sailors, and the procedural rights of the accused officers,” read a statement. The unraveling of the cases against the sailors began soon after the collisions. Richardson’s subordinates, two three-star admirals, handed out an initial round of punishments to sailors and officers on the two destroyers — but decided against pursuing criminal charges. They found the wrongdoing not serious enough to recommend a court-martial. Concerned about the outcomes, and under fire from Congress, Richardson ordered a second review of the evidence that resulted in criminal charges against six officers and enlisted crew members on the Fitzgerald and McCain. The array of charges included negligent homicide against the two captains and junior officers, accusations that could have led to three years in prison and dishonorable discharges. The review was overseen by a four-star admiral on Richardson’s staff with no known experience in conducting courts-martial, as military trials are known. In yet another surprising development, a judge eventually ruled that the admiral had worked with prosecutors to develop evidence against the captain of the Fitzgerald, instead of acting as a neutral arbiter. The judge ultimately disqualified the admiral, throwing the case into legal limbo. Richardson’s No. 2, Adm. Bill Moran, was also found to have engaged in “apparent” unlawful command influence. The judge said the public remarks on the case made by Richardson and Moran were no slips of the tongue but part of a “coordinated message” that risked tainting some of the criminal cases. Richardson and Moran “knew they should not discuss the specifics of this case, yet they repeatedly did,” the judge wrote. At every stage, Navy prosecutors failed to convince judges and jurors of the legitimacy of their allegations. The charges of negligent homicide were dropped. Criminal charges against another officer were dismissed. And at least four separate military panels have ruled in favor of sailors that the Navy sought to expel from the service. Richardson and Moran, who was nominated Wednesday as the next chief of naval operations, declined to comment, citing the pending cases. The Navy declined to make any official available for an on-the-record interview, but it provided a legal expert to provide comment anonymously. The legal expert, a senior officer in the Navy’s Judge Advocate General’s Corps, defended the outcomes of the investigations — with some cases dismissed and others resulting in guilty pleas — arguing that they showed that the Navy was dedicated to fairness and due process. To the lawyers defending the accused sailors, the botched prosecutions by the Navy amounted to a tragedy on top of a tragedy. People’s lives were upended, careers destroyed, families twice traumatized, they have argued, because Richardson decided to send a message rather than pursue an impartial and fair trial. Richardson, they have asserted, targeted these individuals to distract from larger, more systemic failings, failings that had plagued the Navy’s vaunted 7th Fleet for years, and that were exposed for the world to see in two of the deadliest Navy accidents in years. ProPublica has previously documented the Navy leaders’ disregard of years of warnings of impending disaster in the 7th Fleet. In a statement on Richardson’s decision to drop charges, the legal team defending the captain of the Fitzgerald, Bryce Benson, said he had been deprived the opportunity of a fair trial. David Sheldon, a private defense attorney representing Lt. Natalie Combs, the junior officer whose charges were dropped, said the Navy needed to address its own shortfalls in sailors and training instead of targeting crew members. In June 2017, the Fitzgerald was traveling at night 12 miles off the coast of Japan when it collided with the ACX Crystal, a 30,000-ton cargo ship. Two months later, disaster happened again. The McCain was hit by the Alnic MC, a 30,000-ton oil tanker, while traveling in the Singapore Strait. The 17 sailors who died on the destroyers drowned in their sleeping quarters. The two fatal accidents followed collisions earlier in the year involving two other warships in the 7th Fleet’s area of operations, covering hot spots in North Korea, China and other countries in the western Pacific region. The string of mishaps turned into a test of command for Richardson, who was appointed to lead the Navy in 2015 by President Barack Obama. Richardson had risen through the ranks as a member of the Navy’s elite submarine command. Submariners are known for a steadfast commitment to safety. There’s little room for mistakes while carrying nuclear weapons hundreds of feet below the ocean’s surface. Richardson fit the mold. He had a reputation for being a hard-charging, cerebral commander who focused on data and details. His accomplishments ranged from confronting newly aggressive naval forces in China and Russia to overseeing the integration of female sailors in the submarine fleet to implementing a new tattoo policy. The collisions in the summer of 2017 demanded his attention. Congress and the Navy wanted to know how such technologically advanced warships had struck two slow-moving cargo vessels. Richardson promised full and fair investigations. As the Navy’s top officer, Richardson was expected to closely monitor the investigations. But he had to be careful not to indicate his own belief in the guilt or innocence of the accused because his words might influence his subordinates and members of any jury for a court-martial. There’s a deep history of concern over command influence on the military justice system. After World War II, thousands of troops returned home with complaints about the arbitrary nature of discipline, which placed power in the hands of the accused’s commanding officer. Reforms were designed to balance civilian jurisprudence and military order. Sailors charged with serious offenses generally have the right to trial and the right to counsel, for instance. But commanders continue to play a central role. Every court-martial is initiated by a commander known as a convening authority. There’s no exact parallel in the civilian court system. Convening authorities are part traffic cop, part judge and part appellate court. The commander receives a report from an investigator and decides whether a case is serious enough to merit a court-martial. Alternatively, the commander can dismiss the charge or handle it internally, through what’s called nonjudicial punishment. In most cases, the commander retains power over the outcome, with the ability to reduce or suspend sentences. For the military, the logic is clear. Military justice exists to punish criminals but also to maintain order. Commanders are best situated to make the determination about a service member’s conduct. Gene Fidell, who teaches military law at Yale University, said questions about improper influence are a constant threat to a system in which commanders retain such control. Congress and the Pentagon have wrestled for years over the issue, with some arguing that commanders should be replaced by independent prosecutors. The Navy’s investigations began when Rear Adm. Brian Fort flew to Japan just days after the collision of the Fitzgerald. He interviewed scores of sailors, reviewed ship’s logs and analyzed radar tracking. Fort sent drafts of his report to Navy attorneys working for Richardson and another superior, Adm. Scott Swift, the head of the Pacific Fleet. The practice disturbed Vice Adm. Joseph “Joey” Aucoin, the commander of the 7th Fleet. He was surprised his superiors were involved without his knowledge. And from prior experience, Aucoin knew he and his superiors were supposed to maintain their distance from investigators. In a statement, Fort said he shared drafts of his report with Richardson’s office only for clarifying administrative details or, literally, swapping one adjective for another. He said he retained full control of the final report and its findings and recommendations. When Fort completed his report in late July, it was 13,000 pages long, including attachments. The inquiry determined that there was no excuse for the crew’s failure to notice the approaching vessel. The night was clear. Officers on watch should have seen the vessel from as far away as 12 miles. The ship’s navigation radars had problems, but the crew should have been able to fix them. On the basis of Fort’s findings, Aucoin decided that he would fire the Fitzgerald’s captain and its second in command. The rest of the sailors would have their pay docked or receive formal letters of admonishment. But Aucoin chose not to recommend court-martial for any sailor. In his mind, the sailors had made serious mistakes, but nothing that rose to the level of serious criminal conduct. He took into account that the crew had saved the Fitzgerald, and that it had been hampered by manpower and training shortfalls. Swift asked Aucoin to see his findings before he delivered them to the sailors. Swift passed the recommendations to Richardson and his senior advisers. Richardson is “ready to move forward with Joey’s intended accountability actions as laid out below, with the understanding that these actions are initial responses based on the investigation which is still underway,” wrote Moran, the vice chief of naval operations, in an Aug. 10, 2017, email. After Swift received the email, he wrote back to Aucoin. He congratulated him for making a “good call” in forgoing courts-martial. “Leadership would have disapproved it anyway,” Swift told Aucoin. On Aug. 17, Moran announced the findings at a press conference in Washington. The next morning in Japan, Aucoin conducted a set of hearings, known as admiral’s masts, with the sailors he was set to punish. He did so, he said, convinced that Richardson supported his determinations. Aucoin met with each sailor individually to break the news. Then he met with the Fitzgerald crew on the ship’s rear deck to explain his actions. Three days later, the McCain collision happened. Vice Adm. Phillip Sawyer, a career submarine officer, conducted the inquiry into the accident. The outcomes were similar to the Fitzgerald’s. Nine of 16 sailors accused of misdeeds received some form of reprimand or dismissal. But, like Aucoin, Sawyer did not recommend court-martial for anyone. Sawyer did not return a request for comment. Swift declined to comment. The back-to-back collisions set off alarms in Washington, and Sen. John McCain led the charge for accountability. McCain, then chairman of the Senate Armed Services Committee, was suffering from brain cancer that would eventually lead to his death. But he had a very personal stake in the matter. The John S. McCain had been named after his father and grandfather, both Navy admirals. McCain himself had been a Navy aviator. At a hearing in Washington in September 2017, McCain addressed Richardson directly, telling him he expected a full accounting of the accidents. With the families of many of the fallen sailors in the room, McCain’s anger and demands led to some instant speculation: Richardson’s job was on the line. Richardson had already begun his work. He had fired Aucoin just three days after the McCain collision. Two of Aucoin’s subordinates were later dismissed. Swift announced his retirement after Richardson called to tell him he would no longer be promoted. Another three-star admiral, Thomas Rowden, submitted his resignation. Collectively, it was the largest number of senior officers fired or dismissed for mishaps since World War II. Richardson also commissioned several reports to determine what had gone wrong. One focused on mistakes made by the captains and crew members of the Fitzgerald and McCain. It found they failed to prevent “avoidable” accidents. A second report examined systemic issues — blaming unrealistic demands by the top of America’s military establishment. The report concluded that the Department of Defense and Navy officials were constantly sending Japan-based destroyers on new missions. Local commanders, short on sailors, ships and training, had failed to push back against such orders. Sailors simply made do — with 100-hour workweeks, missions extended for months at a time and long days spent waiting for ship repairs. Richardson was not finished. He decided he needed to take a second look at the punishments that his subordinates had given to the sailors. Such a move was within his rights. In his letter approving Aucoin’s decisions, Moran had even noted that the punishments were “initial responses” subject to further inquiry. But Richardson’s decision raised inevitable questions: Was he trying to deflect attention from the systemic staffing and training problems — all of which had occurred on his watch — and thus trying to appease Congress and save his job? To reconsider the question of criminal charges, he selected Frank Caldwell, a four-star admiral in charge of the Navy’s nuclear operations and a member of Richardson’s senior staff. As a fifth-generation graduate of the U.S. Naval Academy, Caldwell was blue blood Navy — his great-great-grandfather had commanded a battleship in the Spanish-American War. Like Richardson, Caldwell rose through the Navy’s secretive nuclear submarine fleet. But the selection was puzzling. Caldwell had never handled a court-martial, according to two officials. Caldwell’s legal adviser, Capt. Mike Luken, told a conference last year that Caldwell’s lack of knowledge had required in-depth explanations of the legal process, the officials said. Caldwell and Luken declined to answer questions. A spokesman said the Navy could not determine Caldwell’s judicial experience. “The Navy does not track the number of cases convened by a particular individual,” Cmdr. Jereal Dorsey said. Richardson gave Caldwell the authority to reexamine every sailor’s case in a special kind of court-martial that consolidated the Fitzgerald and McCain investigations. Caldwell would review 22 sailors’ cases, thousands of pages of evidence, in hearings that spanned two continents. In the civilian legal system, suspects cannot be tried twice for the same crime after a conviction or an acquittal. But under military law, the nonjudicial punishments imposed by Aucoin and Sawyer were not considered trials. Caldwell was free to recommend criminal charges. Lt. Cmdr. Jacqueline Pau, Richardson’s spokesperson, said Caldwell’s appointment “was not about dissatisfaction with the first round” of punishments. At times, Caldwell’s unfamiliarity with the process became apparent. In early January, as he was wrapping up, Caldwell engaged in a flurry of conversations with Navy leaders to let them know about his intended punishments. On Jan. 11, he briefed Spencer, the secretary of the Navy, on his plans. At first, Caldwell told Spencer that none of the charges he intended to file were criminal under the Uniform Code of Military Justice, or UCMJ. Two days later, in a follow-up email, he corrected himself. He had apparently been confused about the punishments he planned to impose. When he had finished his review, Caldwell decided that five sailors would receive nonjudicial punishment. Four others would have their cases dismissed. Seven would receive letters counseling them on their actions. Five officers and an enlisted sailor would face courts-martial — a dramatic increase in the legal stakes confronting the men and women involved in the deadly accidents. The officers would be charged with negligent homicide. In legal terms, that meant they had not exercised the caution expected of a “reasonably careful person” in leading their warships. Equivalent to a felony, the charge carries a three-year sentence. The sailors also faced dishonorable discharge and the forfeiture of all pay. All the senior officials realized the gravity of the court-martial allegations. In 12 fatal maritime accidents since 1969, the Navy had only held a handful of courts-martial. Nobody had been charged with negligent homicide. The decision alarmed many officers and enlisted sailors. The Navy is accustomed to commanders losing their jobs after accidents; captains have “absolute responsibility” for everything that happens on their vessels. At issue was fundamental Navy practice. The Navy demanded that Benson and his fellow officers make tough judgment calls in training for combat, and the Navy understood that sometimes those calls would end badly. But the criminal charges implied that the collisions were not mere accidents — and that commanders and officers had been complicit in the deaths. Caldwell’s determinations opened new wounds. Sailors who had escaped punishment now found themselves with formal findings that wrecked their chance of career advancement. Officers who had accepted punishment based on the evidence now faced far more serious allegations based on the same set of facts. Two sailors from the McCain made deals with the prosecution. The McCain’s commander, Alfredo J. Sanchez, pled guilty to dereliction of duty. He had been on the bridge at the time of the collision but hesitated in taking control of the foundering vessel, according to a Navy report. As a result of his deal, Sanchez lost $6,000 in pay and received a disciplinary letter. Jeffery D. Butler, a chief petty officer, pleaded guilty to charges that he had failed to train his sailors on a newly installed steering system for the McCain. Confusion over its operation had contributed to the collision. Butler testified that he himself had only received 30 to 60 minutes of training on the new system. He had tried to train the sailors beneath him but had failed, he told the court. Butler was demoted a rank — costing him an estimated $200,000 in retirement pay that he planned to use to send his three kids to college. One of the Fitzgerald officers also negotiated a plea agreement. Sarah Coppock, lieutenant junior grade, had been navigating the ship on the night of the collision. She panicked as the cargo vessel approached and ordered the Fitzgerald to turn directly into its path, according to a Navy report. She received a letter of reprimand and a forfeiture of pay for a single count of dereliction of duty that resulted in death. She told the court that she would never forget her mistake. She had tattooed on her wrist seven shamrocks, one for each of the fallen sailors, and the coordinates of the Fitzgerald at the time of the collision. Several sailors won reprieves. Lt. Irian Woodley had been in charge of tracking incoming ships on radar and other sensors in the Fitzgerald’s windowless combat room. But after a hearing, the criminal charges against Woodley were dismissed. Instead, Navy officials sent him to a personnel board to determine whether he should be expelled from the service. The board, made up of three officers, decided in Woodley’s favor. At least three other sailors won similar decisions and were allowed to remain in the Navy. For sailors who found themselves hauled up twice on similar charges, the experience was discouraging and disappointing. Cmdr. Sean Babbitt had been one of the first sailors to learn his fate — or so he thought. Babbitt had been the second-in-command on the Fitzgerald at the time of the collision. As executive officer, he took control of the ship after Benson suffered a traumatic brain injury. He successfully guided the destroyer back to port during a harrowing 17-hour rescue effort. But at the disciplinary hearings in August 2017, Aucoin told Babbitt that he had lost confidence in his ability to lead. Aucoin felt the 40-year-old officer had failed to properly train the sailors who were standing watch on the night of the collision. Training was one of the main duties of a second-in-command. Aucoin told Babbitt that he was relieving him as executive officer of the Fitzgerald. But the 7th Fleet commander decided against criminal charges. He believed Babbitt had acquitted himself well in rescuing the ship. He told Babbitt he wanted to hire him. “I want to bring you on my staff,” Aucoin said. With 18 years of service, Babbitt had been on a path to captain his own warship. But Aucoin’s decision effectively ended that dream. The Navy was not going to award a command at sea to somebody who had been fired. His career was over. Aucoin was shuffling him off to the “land of broken toys,” as some referred to headquarters jobs filled by career-compromised officers. Babbitt at least knew the outcome. “Everybody understood that all the discipline had been completed,” Babbitt said. Five months later, on Jan. 15, 2018, Babbitt learned he was wrong. He received formal notice that Caldwell was punishing him for dereliction of duty. Even though firing was not technically considered punishment, Babbitt felt the Navy was coming after him a second time. Babbitt brought evidence to the hearing to fight back. During his short time on board the Fitzgerald — he had taken over as executive officer only three months before the accident — he had been working to improve communications among the crew. He also brought documentation showing that higher-ups had ordered the Fitzgerald on patrols, even though the ship was undermanned and undertrained. Caldwell had already informed Richardson and his superiors about his intended punishments. Babbitt’s testimony did not change his mind. He found Babbitt guilty and issued him a formal letter of reprimand. Babbitt was floored. In practical terms, the reprimand was the equivalent of a misdemeanor. He had not been sentenced to lose pay or rank. But it stung. The Navy had found him guilty of a crime. Babbitt felt like he was being scapegoated. Court-martial hearings got underway last spring at the historic Washington Navy Yard, established in 1799 as a national shipbuilding facility. The campus overlooks the banks of a silted-in tributary of the Potomac River. Only two officers chose to face trial: Benson and Combs, who had been in charge of the Fitzgerald’s combat center. Both had been punished previously by Aucoin. Both denied that they had done anything criminal. In June, the Navy’s criminal case began its slow-motion collapse. Without explanation, Caldwell dropped the negligent homicide charges against Combs and Benson. Both continued to face accusations of dereliction of duty. A few months later, the defense teams cited Richardson’s string of comments regarding the guilt of the accused in an effort to have the charges dismissed. He had talked to the press. He had appeared before Congress. And, as Pollio had testified in court, he’d conveyed his views when presenting to an auditorium at the Pentagon in front of hundreds of sailors. Pollio’s recollection proved contentious. The prosecutors produced an affidavit from one of Richardson’s speechwriters: “To the best of my recollection, I am also confident that the CNO never used the word ‘negligent,’” Lt. Cmdr. John P. Kennedy wrote. But the judge in the case, Capt. Jonathan Stephens, discounted Kennedy’s statement. In a ruling, he cited internal emails showing that after the presentation, even Richardson’s subordinates were concerned that the Navy’s top officer was inviting charges of unlawful command influence. Caldwell was also concerned about the possibility of unlawful command influence. After a press conference where Richardson remarked that the commanding officers on the Fitzgerald were “at fault,” Caldwell wrote a memo declaring that he had not been affected by his boss’ opinion: “I have no preconceived notions as to what further actions, if any, should be taken,” Caldwell wrote. In a later memo, Caldwell would acknowledge that he had been in contact with Navy senior leaders at least 27 times between October 2017 and June 2018 — three times a month, on average. He discussed the case with the Spencer, the secretary of the Navy, on five occasions, with Richardson on nine occasions and with Moran on 22 occasions. It’s impossible to know for certain the details of the conversations. None of the men had been extensively questioned about them. But Caldwell wrote that none of the men had attempted to influence him. And, he said, he had not been influenced by them. “My actions have been independent and based on my own review of the evidence,” he wrote. Stephens’ December 2018 ruling amounted to a two-part decision, absolving Richardson and others of the worst form of undue command influence but finding they had not been entirely impartial. Stephens noted that, at least in official statements, the Navy had stressed the presumed innocence of the accused. And he accepted Caldwell’s claims that he had not been influenced by any of the unscripted public remarks made by Richardson and Moran. But, Stephens decided, Richardson and Moran, the Navy’s two most senior officers, had failed to follow the rules. He declared that their statements constituted “apparent” unlawful command influence. He did not dismiss the case. But he increased the legal tools available to the defense to explore jurors’ sensitivity to such pressure. Longtime military justice experts were not surprised by the ruling. A month later, Stephens issued a second ruling for Benson — even more devastating to the Navy’s case. As the so-called convening authority for Benson’s court-martial, Caldwell had a duty to act as an impartial and unbiased arbiter. But as he prepared to hold hearings for Babbitt and other officers in Japan, he drew up a list of questions to ask each of them. The questions were intended to help further Caldwell’s understanding. In Babbitt’s case, for instance, Caldwell wanted to know what Babbitt had done to fix degraded navigational equipment. But at least two of the questions were written by Navy prosecutors and passed on to Caldwell through his legal adviser. The prosecutor’s inquiries appeared designed to gather evidence to use against Benson. For instance, one question required Caldwell to ask accused sailors whether Benson had ever disciplined anyone for not warning of an approaching ship. “Did he even care?” Caldwell’s script read. The Navy’s legal adviser suggested that the questions were within Caldwell’s purview, since the answers might have helped inform his judgement on the punishment due to the accused. To Stephens, however, Caldwell had crossed a line. In asking questions to gather evidence against Benson, he had “impermissibly adopted a prosecutorial role rather than a neutral role,” Stephens wrote. The result, said Stephens, was that Caldwell was no longer qualified to oversee the court-martial process. The decision threw the court-martial against Benson into disarray. Under military rules, the Navy had to find someone with a higher rank to replace Caldwell. In practical terms, that was two people: Richardson and Spencer. “It’s a very limited pool,” said the senior Navy legal adviser. Richardson’s decision to dismiss the cases was acknowledgement that the Navy had left itself few options to proceed. Sheldon, a private attorney representing Combs, said the Navy needed to examine whether it had investigated the right people. “The deaths of these sailors rest not upon the shoulders of a junior officer; they rest upon Navy leadership,” Sheldon said. This article was originally published in ProPublica. It has been republished under the Creative Commons license. ProPublica is a Pulitzer Prize-winning investigative newsroom. Sign up for their newsletter.